Vietnam’s China-beating economic growth rate is the envy of Asia, as neighbors struggle to keep up with its 7.4% pace. That does not mean officials in Hanoi should be sleeping easy. The death toll in Vietnam from landslides and heavy rain triggered by a tropical depression earlier this week has climbed to 68, with another 34 people missing. The General Statistics Office (GSO) announced that the GDP growth rate in the third quarter of the year reached 7.46 percent, a record high level that surprised all analysts. Stock analysts have predicted the market will likely extend gains this week but divergence will continue in the context of third-quarter earning reports. Nearly 90 farmers with significant achievements in the fields of agriculture and rural areas were honoured and presented with the “Outstanding Vietnamese farmers in the 30 years of Doi Moi (Renewal)” title during a programme held in Hanoi on October 14. The Ariyana Convention Center, a key venue of the Asia-Pacific Economic Cooperation (APEC) Leaders’ Week slated for Nov. 6-11 in Vietnam’s central Da Nang city, was inaugurated on Sunday in the presence of Vietnamese Prime Minister Nguyen Xuan Phuc. Five luxury motor boats with the capacity of 25 passengers each and maximum speed of 50 kilometers per hour have been put into operation, taking tourists to destinations in HCMC and neighboring areas. Prof., Dr. Bui Chi Buu, former director of the Institute of Agricultural Sciences for Southern Viet Nam, speaks to Viet Nam News about the agricultural challenges facing the Cuu Long (Mekong) Delta and measures to cope with them. Gas and oil power plants are expected to benefit from the new decision of the Ministry of Industry and Trade (MoIT) that has suspended the operation of the competitive electricity generation market. Recruitment demand for senior and middle-level positions by Navigos Search clients are continuously increasing. In the third quarter of this year, the number of such job orders rose 19 per cent year-on-year. The mid-priced apartment segment in HCM City is developing strongly with demand and supply and liquidity all looking up, especially in the eastern part, experts said. The Ministry of Industry and Trade (MoIT) will submit its plan to offload part of the State’s capital in Sabeco to Deputy Prime Minister Vuong Ðình Hu? by October 20. The number of foreigners buying real estate products in Viet Nam has increased, but the domestic property market needs policies to attract more foreign investment, according to experts. The Sofitel Legend Metropole Hanoi will transport guests to a world of gastronomy at the Les Arômes Festival 2017, Vietnam’s premier wine and food festival, from October 26 to December 7. Prime Minister Nguyễn Xuân Phúc said yesterday that the specific forest management and protection responsibilities of local authorities, Party units, collectives and individuals should be made clear. The retail space leasing market in Ha Noi has recorded its best occupancy and rental rates in the last five years, according to Savills Vietnam. Anphabe opened the Vietnam Happiness At Work Summit 2017 on October 12, in the presence of more than 600 CEOs and human resource (HR) managers from leading organizations. 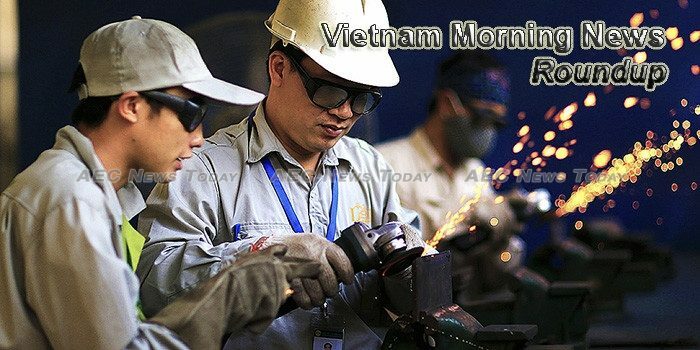 The fourth industrial revolution (Industry 4.0) is considered a golden chance for developing countries like Vietnam to improve quality of services, goods and competitive advantages. Mr. Vu Cuong Quyet, General Director of Dat Xanh Mien Bac, and Mr. Vu Tuan Truong, General Director of Defuco Vietnam (DFC), have signed a memorandum of understanding (MoU) in Hanoi.